My desk has been found and is ready for action. I finished cleaning up my studio this past week, so I can get back to work for my upcoming Annmarie Gardens show (more on that soon). I’m especially excited about my shelf organizer, which I’ll tell you more about next week! I’m back! I recently moved to a new location and am now in the process of unpacking, organizing and setting up my brand new studio. 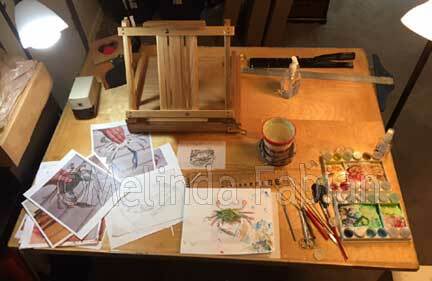 I think it is fun setting up a new studio; it always feels like a fresh new start. 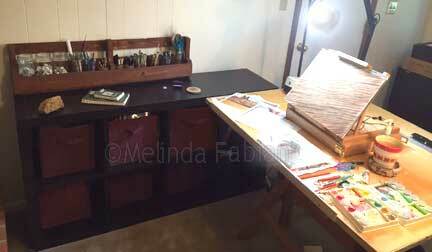 And, of course everything gets a thorough cleaning, but is also a bit messy until I figure out the new layout and where to put all of my art supplies. My desk became the convenient place to pile all of my supplies. At times the clutter of unpacking can be a bit overwhelming till all of those brushes, pencils, paints and markers find a new home. But, eventually everything is finding a new place. I’ll be posting photos of my new studio next.